Lions fund raising night, a roaring success Sat 25th August saw the culmination of weeks of preparation followed by a few final days of sheer panic come to fruition. 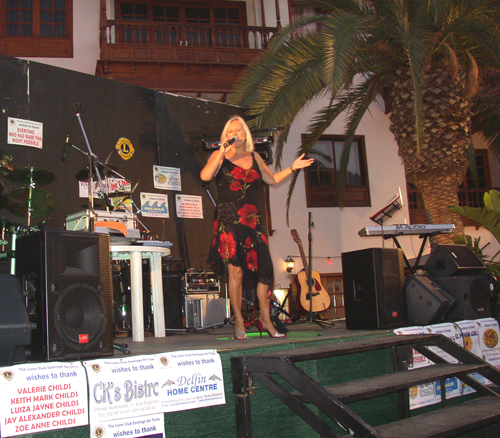 It was the idea of Lions President, Mary Thompson to hold a music concert in the plaza of Los Gigantes to raise funds for the local Fire Brigade and for the Orobal Centre for disabled children. So to the day. The stage was set up and all preparations made whilst waiting for the equipment to arrive. At 3.30pm the Public Address system and lighting, courtesy of Viana Shows, along with their technicians, on their day off, arrived and during the course of the next 4 hours various artists and even more equipment arrives. Mayhem ensured on stage where the multitude of cables began to resemble a demented spider’s web. 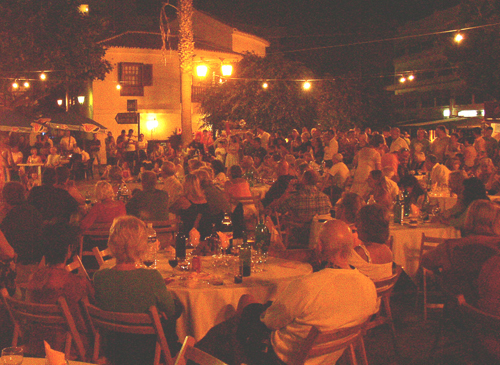 The plaza was transformed from its usual vista by the arrival of the caterers and their tables into a large dining room. As the guests arrived and were seated, various Lions were still running around putting the last touches together. So, all ready to go (and only half an hour late). Compere for the evening, Lion Paul Marley introduced Helen Dixon-Pride who opened the evening with a fantastic set of swing and jazz, much to the audience’s approval. As Helen was completing her set, frantic phone calls were in progress to find out where the Flamenco show was, as they had not arrived. Denise Bell, of Viana Shows who had donated the show, discovered they had been involved in an accident on route, no one was hurt but they would not be able to make it. 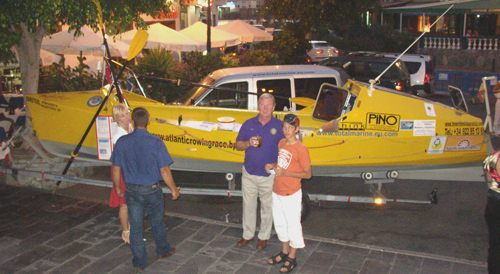 Whilst Denise tried to sort out a replacement Paul introduced Pedro and Peter two ocean rowers who are going to row the Atlantic in a 23ft ocean rowing boat to raise funds for the Orobal centre, and Lion Steve Gilbert explained that this was one of the few great challenges, 3000 miles of open ocean from La Gomera to Antigua. During which time a few phone calls from Denise had the problem sorted out. A Brazilian Carnival Dance troop arrived and thrilled the audience with their acrobatic and dance skills. The raffle ticket sales for the €1000 first prize were going well and people were getting used to the idea of being approached and “mugged” by a tall red-headed punk in the form of Lion, Sheila Widdrington. It seemed like a punk take over for the evening, the former evening suited compere had suddenly been replaced by a purple headed punk, who then introduced Paul Lee with his Meat Loaf tribute show. His enthusiastic and powerful delivery soon had people on their feet dancing. The night was really hotting up. Lion president Mary introduced one of the young children from the Orobal centre to remind us all why we were there. 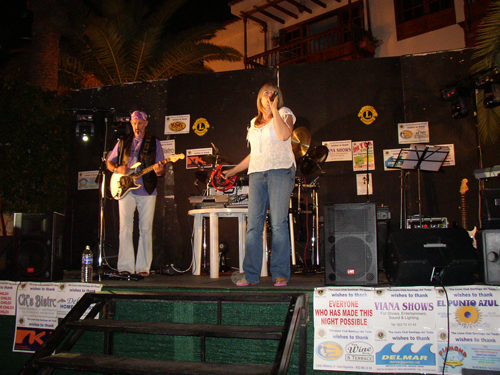 Next up was Old Dogs New Tricks, one of the finest cabaret duos on the island. 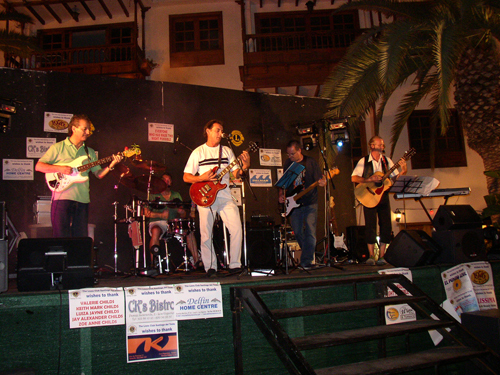 They were enthusiastically received by the audience and the dancing was now in full swing. Schedule, only running half an hour late, so on with the show. 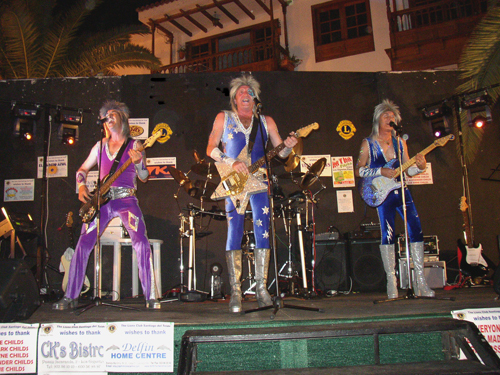 Glamslam, a 70’s glam rock trio wooed the audience and brought a nostalgic sigh to many of the audience who grew up in a period of T Rex and Sweet. Lion president Mary came on stage and the raffle was drawn by Pedro, one of the rowers. 1st Prize Ticket No. 5401 €1000. 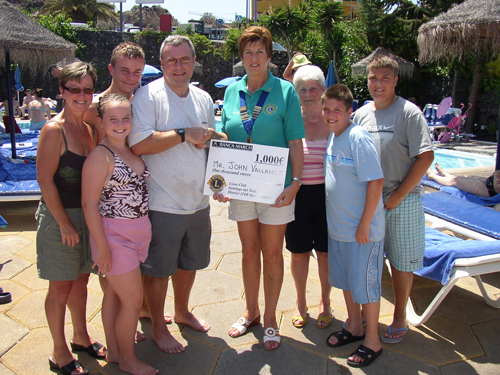 Won by Mr John Vallance from Kent, on holiday in El Marquez with his family. Finally Roy England, who had been assisting introduced the 5 piece rock group Underground (It’s Immaterial) who were enthusiastically received by the waiting audience. 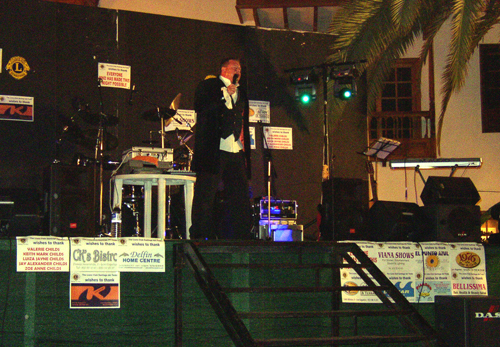 The band rocked the night away with renditions of such classics as Cocaine, Road to Hell and Comfortable Numb as well as their own totally original music written by Kevin Allen and arranged by the group with not a backing track in sight. At the end of the night all agreed that the night had been a “Roaring” success. The night would not have been possible without the kind assistance of all of the artists, the sponsors and the many other people who donated their time and energy. Lions President, Mary Thompson wishes to thank the following people and a special thanks to the other Lions, and helpers, who have not been mentioned by name but none the less were there, supporting the president. Private letters of thanks have been sent to the Ayuntaniento and to the Police thanking them for their assistance. Underground (It’s Immaterial) THE BEST!!! Im grateful for the post.Really looking forward to read more. Really Great…. I really enjoy the blog post.Really thank you! Keep writing…. Im thankful for the article post.Thanks Again. Keep writing….